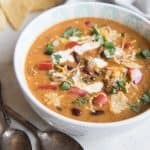 This easy, Cheesy Taco Soup is a completely satisfying, full-flavored soup that is made in one pot in under 30 minutes, then garnished with all your favorite taco fixins'! It's loaded with wonderful flavors and textures that make it one of our go-to meals during the cooler months. Plus, I can have it ready in under 30 minutes, with minimal fuss, which is a huge help on busy, blustery days. In a large pot or Dutch oven over medium heat, brown the meat with the onions until fully cooked. Add all of the spices and seasonings, chopped bell pepper, and garlic and stir well to combine. Sprinkle the flour over the ground beef mixture and stir to combine, then continue to cook over medium heat, stirring constantly, for 2-3 minutes. Stir in the kidney beans, black beans, green chilies, salsa, enchilada sauce, chicken broth and 1 cup of water (additional water may be added later to thin soup to desired consistency). Bring to a boil, then reduce heat and simmer for 10 to 15 minutes, stirring occasionally, until slightly thickened. Over low heat, stir in the cubed, softened cream cheese until completely melted. Remove the soup from the heat, then stir in the cheddar and Pepper Jack cheeses until melted. Add additional water to thin the soup, if desired. Serve with any or all additional garnishes, although I almost never skip the diced tomatoes, onions, and cilantro, which add both texture as well as flavor to the soup. You could also make this in the slow cooker by first browning the meat and onions, then adding them to the slow cooker with all the remaining ingredients except for the cream cheese and the Pepper Jack and cheddar cheeses. Cook on high heat for 3-4 hours, or on low for 6-8 hours, then stir in the cream cheese and other cheeses until melted as described in the recipe above before serving.